Starting in the vastness of western Texas, then emerging in the southeastern states as a major highway through several metropolitan areas, Interstate 20 provides an east-west connection through the northern tier of the Deep South states. It originates in West Texas and passes through the Dallas-Forth Worth area en route to Shreveport, Birmingham, Atlanta and Columbia before culminating in Florence, South Carolina. Interstate 20 begins humbly at a split from I-10 near Kent, Texas, but not near any cities or urban areas. 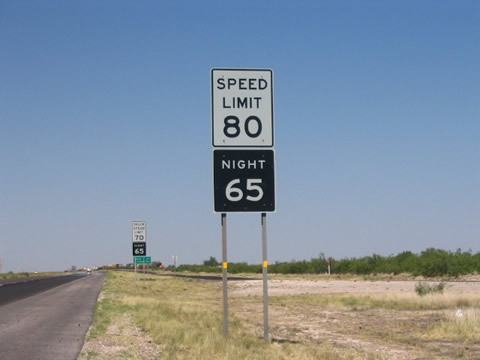 The westernmost section of Interstate 20 travels through some sparsely populated, isolated terrain, which resulted in the 2006 enactment of an 80 miles-per-hour speed limit along an 89-mile stretch between IH 10 and Monahans. This section of Interstate 20 serves mid-sized Lone Star communities such as Midland, Odessa and Abilene. The highway acts at the main conduit between the West Coast and the Dallas-Fort Worth Metroplex. There Interstate 20 bypasses both cities to the south, overriding portions of original alignments of Interstate 820 and Interstate 635 respectively. Interstate 30, beginning at I-20 west of Fort Worth, facilitates movements into Downtown and to Dallas by way of the original Dallas Fort-Worth Turnpike. Interstate 820, the first branch of I-20 from the west, constitutes a belt route around the west, north, and east side of Fort Worth as well. East from Fort Worth, I-20 varies between six and eight lanes as it travels through cities such as Arlington, Grand Prairie and Duncanville to south Dallas. Leaving Dallas, the freeway passes through Mesquite where it transitions from urban to rural environs as it enters the vast Piney Woods region of East Texas. A spectacular view of the Dallas cityscape is offered to motorists entering the metropolitan area westbound along this stretch. Otherwise through the Piney Woods, Interstate 20 serves the cities of Tyler, Longview and Marshall to the state line. Upon entering the Pelican State of Louisiana, Interstate 20 encounters the Shreveport metropolitan area of Caddo Parish. A second freeway loop in the form of Interstate 220 exists, facilitating through traffic around the north side of the city. I-20 meanwhile intersects the current north end of Interstate 49 in dramatic fashion with a multi-level stack interchange. The freeway cuts through the central business district of Louisiana’s third largest city from there. East of Shreveport, Interstate 20 passes by the sprawling Barksdale A.F.B. as it again enters rural landscapes. It is not until the east-west freeway reaches the city of Monroe that the scenery changes. Here lies the busiest stretch of highway between Dallas and Jackson. Monroe was also the location of a second planned bypass route of I-20, defunct Interstate 420.2 At the Mississippi River, Interstate 20 departs Louisiana for Vicksburg, Mississippi via a four-lane cantilever bridge. I-220 comprises the third urban loop of Interstate 20. The north-south freeway carries U.S. 49 northward to an exit of the city and Yazoo City before it concludes at I-55. The metropolitan area spreads eastward along the I-20 and U.S. 80 corridors. The suburbs of Pearl and Brandon provide the freeway with a highly suburban feel. East of Exit 59, Interstate 20 returns to forested environs. The last urban center Interstate 20 sees in Mississippi is Meridian. Here the freeway begins the lengthy overlap with Interstate 59. I-59 is the conduit from New Orleans and Houston to Birmingham and Nashville, and thus adds a substantial amount of traffic to Interstate 20. 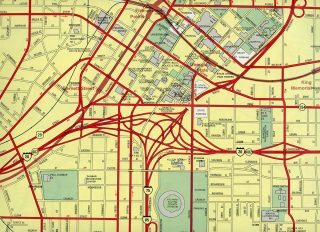 The two highways additionally add U.S. 11-80 and Mississippi 19 to form a five-way overlap through the urban area. Downtown Meridian is situated to the north of the narrow east-west freeway. Entering the state of Alabama, Interstates 20 & 59 travel to Cuba, Alabama 8 and the western reaches of High Priority Corridor 6, a federally mandated corridor between Meridian and Savannah, Georgia by way of U.S. 80. The corridor doubles as the planned extension of Interstate 85. If completed, I-85 will vastly upgrade U.S. 80 to freeway standards west from its current terminus in Montgomery to Interstates 20 & 59. Otherwise Interstates 20 & 59 travel northeast from the state line to Tuscaloosa, home to the University of Alabama. Bryant-Denny Stadium in Tuscaloosa has a capacity of over 100,000 as of 2010, and during Crimson Tide home games traffic congestion arises along Interstates 20 & 59 . Interstate 359 represents an urban spur to both the central business district and the University of Alabama campus while I-20 & 59 skirt the urban area to the south while expanding to six overall lanes. Continuing northeast toward Birmingham, Alabama’s largest city, Interstates 20 & 59 maintain six lanes and see an increasing amount of traffic. For the burgeoning metropolitan area of Birmingham and Jefferson County, Interstate 459 provides a bypass for through travel interests around the city for points north and east. While the southwest suburb of Bessemer is older and more industrial based, the metro area saw massive growth in Shelby County via I-65 south and to the southeast by way of U.S. 280. This adds commuter traffic to I-459, with the majority of the loop expanded to six lanes. Staying north through the highly urbanized area, I-20 & 59 continue northeast toward Interstate 65 and the locally named “Malfunction Junction”. The nickname of the interchange with I-65 is derived from the left-hand ramps linking the two routes and roadway reversal of both freeways through the exchange. Downtown Birmingham lies south of a viaduct along Interstates 20 & 59 and north of Red Mountain. A four-year project replaces the aging six-lane viaduct to 2019. A short distance east of there by is the split of I-59 north from I-20 east. The 154-mile overlap concludes at a trumpet interchange (Exit 130) south of Birmingham-Shuttlesworth International Airport (BHM). Interstate 20 turns briefly southeast, cutting across Red Mountain as it heads through the eastern suburb of Irondale and over Shades Mountain. A symmetrical stack interchange lines this stretch with Interstate 459. Another 11 miles of built-up areas buffer Interstate 20 before the highway leaves the metropolitan area beyond Leeds and Moody. A short portion of Interstate 20 was open to traffic in Mississippi by 1967. With the exception of through Meridian, the freeway ran east from Mississippi 15 (Exit 109) near Newton to U.S. 11 & 80 (Exit 169) at Kewanee. Subsequent sections were opened in 1968 from Meridian west to Pearl and in 1970 on the south side of Jackson. The original configuration of the Capitol Hill Interchange between Interstate 20 and Interstates 75 & 85 (Downtown Connector) in Atlanta utilized a number of left-hand ramps. This exchange was redesigned into a three-level interchange as part of the “Freeing the Freeways” megaproject between 1985 and November 1988. 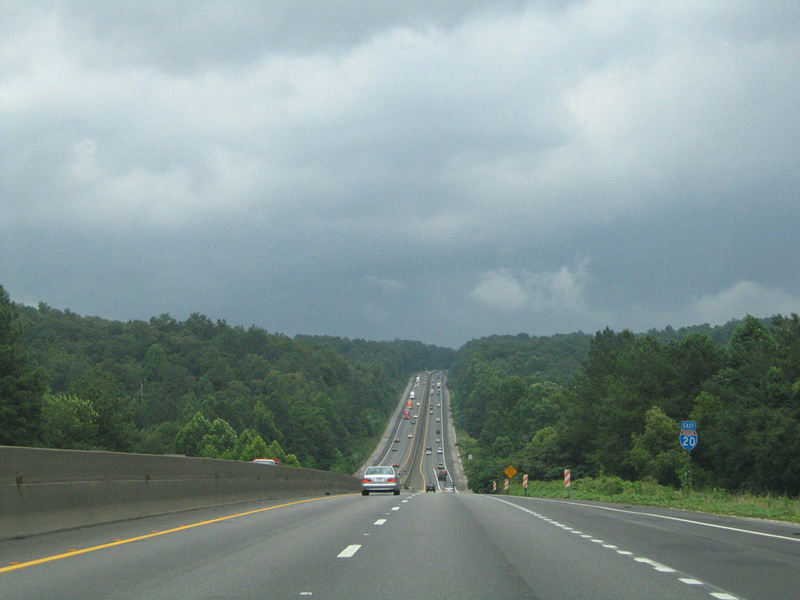 Interstate 20 traverses mountainous areas eastbound near Cook Springs, Alabama (Exit 152) after a rain shower. The freeway remains rural as it advances toward Atlanta, Georgia. Subsequent work along this segment expanded the I-20 to six overall lanes. Photo taken 07/15/05. East from Karr Gap, Interstate 20 returns to rural scenery, albeit this time across the Appalachian piedmont. The freeway lines northern reaches of Talladega Superspeedway, a 2.66-mile NASCAR track, east of the Coosa River and west of Anniston. The city of Anniston has the dubious honor of being well-known for being home to the Anniston Army Depot, home to various weapons of mass destruction including that of sarin gas. I-20 passes south of Anniston through the city of Oxford at Exits 179, 185 and 188. Not long after entering the Peach State, Interstate 20 enters the sprawling Atlanta metropolitan area. 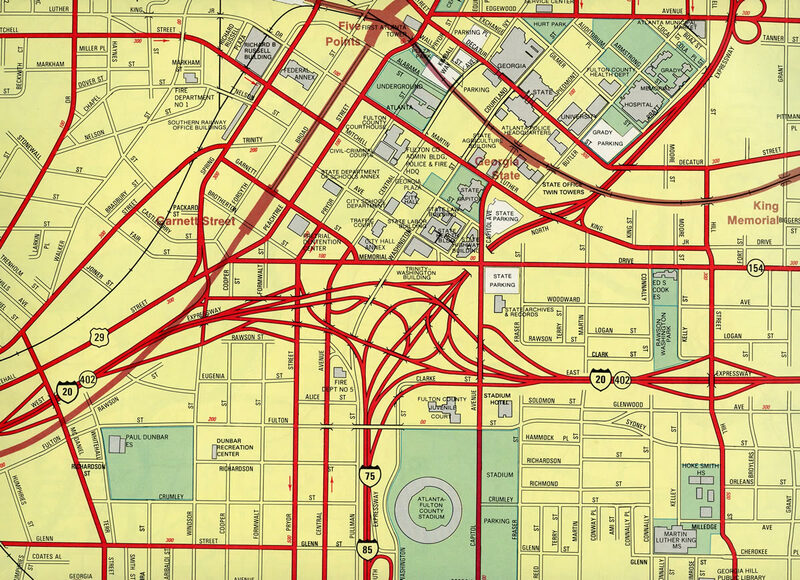 The freeway quickly expands to six, then eight, then ten… to an ultimate expansion of 16 lanes. Although the western interchange with Interstate 285 is vastly substandard, Interstate 20 is quite modern as it travels through the city limits of Atlanta. A compact interchange welcomes I-20 motorists to the central business district and Interstate 75 and 85 overlap, the Downtown Connector. The skyline of Atlanta is nothing short of spectacular. Views from Interstate 20 include the skyscrapers and Turner Field, home of the Atlanta Braves Baseball franchise from 1997-2016, to the southeast. A few curves guide motorists eastward out of the city into Dekalb County and the east junction with the Perimeter Highway. A second cancelled Interstate 420 was to have tied into the I-20 mainline on this curved portion. The south urban loop was slated to incorporate Georgia 166 (Lakewood Freeway / Langford Parkway) into its overall route. 26 miles east of Interstate 285 at Covington, Interstate 20 reduces from six to four lanes as it departs the Atlanta metropolitan area. For the next 150 miles, pine forest and widely spaced interchanges is the norm for east-west motorists. This landscape persists to Exit 190, where the Augusta urban area quickly begins. The final branch of I-20 follows at Exit 195. 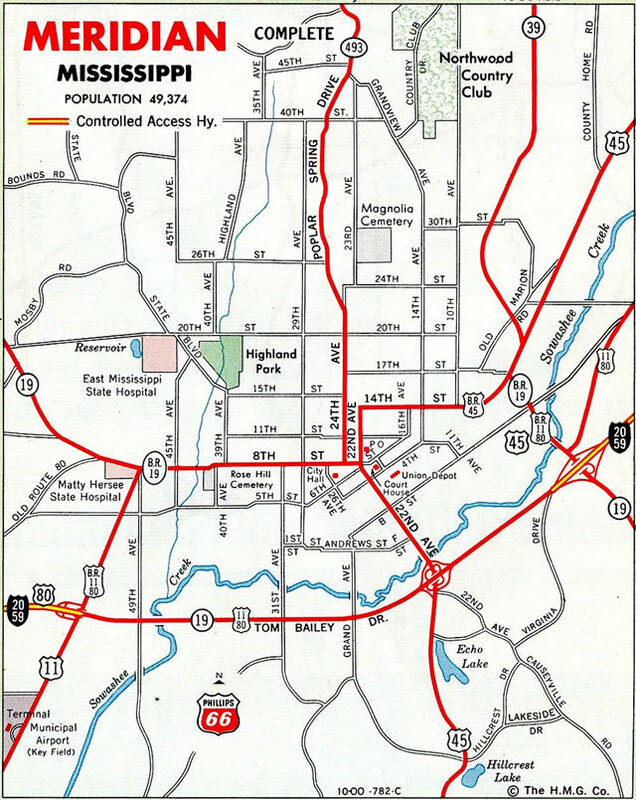 Interstate 520 (Bobby Jones Expressway) arcs to the south and east around the city of Augusta, serving western reaches of the suburban area and industrial areas to the south. The freeway ended ahead of the Savannah River until 2004, when the first of two extensions lengthened the route into South Carolina. A full loop was made of I-520 when it was completed north to I-20 at Exit 6 on December 16, 2009. Once across the Savannah River, Interstate 20 enters the Palmetto State. The 141-mile route across South Carolina is designated the Strom Thurman Freeway, named after James Strom Thurman (1902-2003), S.C. member of the U.S. Senate from 1954 until his death in 2003. The persistant landscape of pine forest along I-20 between Atlanta and Augusta essentially continues east from North Augusta, South Carolina. Elevation changes offer some differentiation to Lexington, where suburbia takes over. The freeway expands to six lanes at Exit 61 ahead of St. Andrews and the north side of Columbia. A second “Malfunction Junction” along I-20 lies northwest of the capital city at Interstate 26. A substandard cloverleaf interchange facilitates movement between the two freeways just north of the I-26 split with I-126 east toward Downtown Columbia, adding to the mix of weaving traffic and sudden lane changes. Together I-20 to the north and I-26 to west form two thirds of the Columbia Beltway system, with I-77 (Southeastern Beltway) rounding out the loop. A pervasive interchange with various flyovers joins Interstate 77 with I-20 and adjacent Alpine Road near Fort Jackson to the northeast of the city. East of there, I-20 was expanded to six lanes in 2014, as suburban expansion lines U.S. 1 east to Pontiac and Exit 82. Leaving central South Carolina, the final 60 miles of Interstate 20 traverse a mixture of pine forest, agricultural areas and wetlands. The freeway avoids the main population centers along this stretch, and lower traffic counts reflect this. At Florence, Interstate 20 concludes at a three-quarter cloverleaf interchange, with directional ramps linking I-20 east with Interstate 95 north and I-95 south with I-20 west. The freeway mainline here defaults onto Business Spur I-20 east. This business route represents the only such occurrence where an Interstate highway ends as a Business route of itself. The city of Florence spreads to the east of I-95, with two shopping malls and other assorted retail linking Business Spur I-20 (David H. McLeod Boulevard) to its end at U.S. 76. Florence is also the only urban area of any consequence along the Interstate 95 corridor in South Carolina. Some have wondered why Interstate 20 ends in an isolated part of West Texas rather than overlap with Interstate 10 and connection to the west coast (perhaps via I-8 or I-10 west of Casa Grande, Arizona). This did not occur due to the significant mileage of dually-signed freeway. Therefore, Interstate 20 is not a coast-to-coast route. Interstate 20 & 59 separates Downtown Birmingham, Alabama from the Birmingham-Jefferson Convention Complex along a six-lane viaduct completed in 1971. The aging roadway was designed to accommodate 80,000 vehicles per day (vpd) but instead carries 160,000 vpd. Deterioration of the elevated road, including the formation of large potholes, led to an estimated $150 million plan by ALDOT to replace the bridge decks on top of the existing foundations. The City of Birmingham and Jefferson County asked ALDOT in 2012 to instead consider replacing the existing roadway with a new structure to improve aesthetics and reduce noise. Design improvements reviewed included wider shoulders, adding auxiliary lanes and reconfiguring the existing traffic pattern to reduce weaving. ALDOT instead committed $450 million to reconstruct the existing roadway. The I-59 / I-20 Bridge Replacement Project reconstructs the freeway with a new viaduct system traveling higher than their predecessors while accommodating ten overall lanes of traffic. A number of other changes will also take place, with new on and off-ramps, and flyovers joining I-65 with I-20 & 59 and the new 17th Street ramps to Downtown. A slide show showing renderings of the work is located here. Phase One of the four-year project commenced in August 2015. The $7.4-million project includes widening sections of road and elevating bridges in preparation for the second and third phases.8 Phase Two, involving construction of the new exit ramps, is scheduled to start in spring 2016. Phase Three, with bids forecast by late 2016, entails tearing down the old viaduct and building the new roadway. 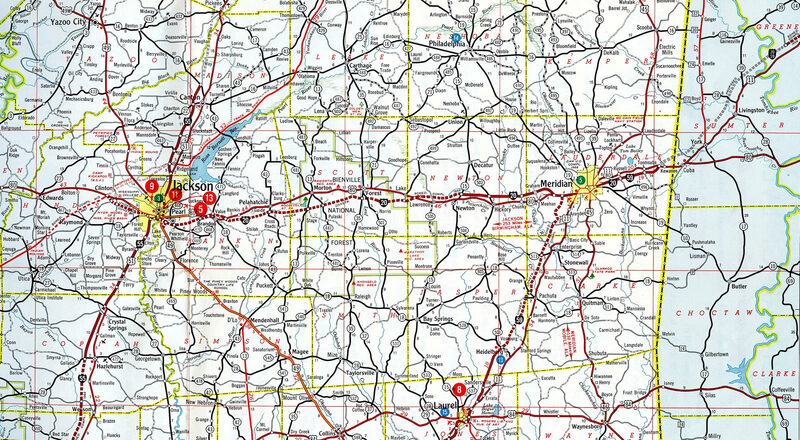 At Chadbourn, at the current intersection of U.S. 74 and U.S. 76, Interstate 20 would meet a proposed easterly extension of Interstate 74. 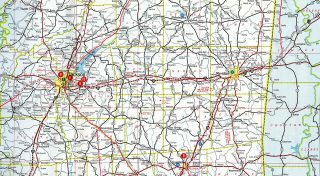 Interstate 74, planned to be extended from Cincinnati, Ohio, southeast on a path roughly parallel to U.S. 52 and U.S. 220, would overlap with Interstate 20 between Chadbourn and Bolton via Whiteville. Interstates 20 and 74 would follow U.S. 74-76 east to Whiteville, then continue on via U.S. 74-76 due east to Bolton. Interstate 20 will continue east from this point into Wilmington, and Interstate 74 would turn south along North Carolina 211 toward Myrtle Beach. Both the extension of Interstate 20 into Wilmington and the extension of Interstate 74 along North Carolina 211 are part of High Priority Corridor 5. Interstate 20 would follow U.S. 74-76 east to Wilmington, passing by proposed Interstate 140, the planned Interstate bypass route for U.S. 17. The first segment of Interstate 140 is planned for completion in 2005, and it will provide a 14.5-mile bypass from U.S. 17 at the Pender County line south to U.S. 421, then onward to U.S. 17 near Bishop in Brunswick County (with an eventual eastern extension from Bishop to U.S. 421 south of downtown Wilmington planned ultimately). After Interstate 140, Interstate 20 would follow U.S. 17-74-76 and North Carolina 133 over the Brunswick and Cape Fear Rivers into downtown Wilmington. Interstate 20 could enter the city directly via U.S. 17-74-76, or it could turn north via U.S. 421 and then east via North Carolina 133 to enter from the north. There would be no direct connection to Interstate 40, which terminates at U.S. 117/North Carolina 132 northeast of Wilmington. The freeway connection to Interstate 40 would be via Interstate 140, which in turn would also connect to the U.S. 17 freeway, which is planned to be upgraded to freeway standards throughout the state. U.S. 17 would be the most direct route to Myrtle Beach to the south and Jacksonville to the north along U.S. 17. There are some in South Carolina who have protested the notion that Interstate 20 should depart their state and enter North Carolina. Instead, some have suggested that Interstate 20 should continue southeast directly Myrtle Beach, perhaps via U.S. 76-301 and South Carolina 22. However, Future Interstate 73 is planned to provide for most of this route. Interstate 20 in Dallas County is part of High Priority Corridor 55: Dallas to Memphis via Little Rock. Interstate 20 replaced U.S. 80 from IH 10 in West Texas to the east side of Dallas. The freeway parallels or overlaps with the remainder of the route east to Cuba, Alabama. There U.S. 11 accompanies I-20 & 59 northeast to Birmingham. U.S. 11 remains along side I-59 northward while U.S. 78 joins the I-20 corridor east to Atlanta. U.S. 78 leaves I-20 for Stone Mountain while U.S. 278 takes over as the freeway companion to Augusta, Georgia. The east-west alignment of U.S. 1 starts in Augusta and takes the US route to Columbia and Camden parallel to Interstate 20. The final miles of the freeway leading into Florence do not parallel a US Highway. Interstate 20 crosses the Darlington/Florence County line upon entering the final three miles. Pictured here is the two-mile guide sign for Exits 141A/B – Interstate 95. Photo taken by Chris Patriarca (06/13/03). Continuing east, we are now one mile west of Interstate 95. Fayetteville, North Carolina, is 90 miles to the northeast and Savannah, Georgia, is 170 miles to the south. Florence is the only major city along the Interstate 95 corridor in the Palmetto State. Photo taken by Chris Patriarca (06/13/03). Approaching Exits 141A/B for Interstate 95 on Interstate 20 eastbound. The northbound ramp for Interstate 95 departs on the left while mainline traffic splits between Business Spur 20 east and Interstate 95 south (Exit 141B). The Exit 141B panel is the first mentioning of Business Spur 20 on Interstate 20 east. Traffic continuing east into Florence via Business Spur 20 will reach downtown in four miles. Photo taken 12/14/01. The Interstate 20 mainline partitions at the final interchange. The Interstate 95 southbound ramp departs shortly from the Business Spur 20 eastbound continuation of the Interstate 20 freeway. Three miles to the south U.S. 76 intersects Interstate 95 at Exit 157. Photo taken 12/14/01. Continuing past the Interstate 95 ramp, Interstate 20 eastbound erodes into Business Spur 20 east at Exit 141B/Interstate 95 south. Traffic continuing eastward along Business Spur 20 is greeted with at-grade intersections and a handful of traffic lights on the trek to U.S. 76 and downtown Florence. Photo taken by Chris Patriarca (06/13/03). Older button copy signs erroneously showed Business Spur I-20 as Interstate 20. Tricolor shields were also found on original signs along Interstate 95 for Business Spur I-20 east as well. Photo taken by Michael Summa (1995). Traveling west on Business Spur I-20 (David H. McLeod Boulevard), this is the first advance guide sign for the junction with Interstate 95 since the Evans Street intersection. The control cities are Fayetteville to the north and Savannah to the south, neither of which are in South Carolina. Photo taken 05/30/07. Continuing west, Business Spur I-20 transitions directly into Interstate 20. The capital city of Columbia is 79 miles westward via Interstate 20 and South Carolina 277. The next business route that serves I-20 is located over 1,100 miles to the west in Baird, Texas along an old alignment of U.S. 80. This is largely because Georgia, Alabama, and Mississippi do not use business loops on Interstate 20. Photo taken 05/30/07. Exit 141A departure of the southbound Interstate 95 cloverleaf ramp from Business Spur I-20 west. The bridge in the background carries eastbound motorists to Interstate 95 north to Fayetteville, North Carolina. Photo taken by Chris Patriarca (06/13/03). Interstate 95 bypasses Florence to the west, straddling the city limits from the upcoming directional cloverleaf interchange (Exits 160B-A) with I-20 west and Business Spur I-20 east, to U.S. 76. Photo taken 01/01/17. The first section of I-95 expanded to six lanes within the Palmetto State was the stretch leading south from S.C. 327 to I-20 at Florence. The third lane added along I-95 southbound in 2004 defaults onto Interstate 20 west (Exit 160B) for Columbia. Photo taken 01/01/17. Signs for Exits 160B/A erroneously show Business Spur I-20 as Interstate 20. The forthcoming ramp connects with David H. McLeod Boulevard, a commercial arterial leading east to Magnolia Mall and U.S. 76 at Florence Mall. Photo taken 01/01/17. A second set of overheads outline the ramps for I-20 west and Business Spur I-20 east. Speed limits are posted at 70 miles per hour on Interstate 20 west between Florence and Columbia as the freeway traverses mostly wetland and otherwise rural areas outside Bishopville and Camden. Photo taken 01/01/17. Interstate 95 south at the lane drop for Exit 160B and the westbound beginning for Interstate 20. I-20 is designated the Strom Thurman Freeway between Florence and Columbia. The capital city lies 75 miles to the west. Photo taken 01/01/17. A loop ramp joins the ending freeway of I-20 ahead of Magnolia Mall. Business Spur I-20 travels 2.1 miles east to U.S. 76, which leads directly to Downtown Florence. Photo taken 01/01/17. The original button copy sign for the one mile approach of I-95 south for I-20 west and Business Spur I-20 east. Interstate 20 is the only instance in the system where a two-digit Interstate route ends as an Interstate business route. Interstate 96 used to end in this manner in Muskegon, Michigan, until the business spur was decommissioned. Vidcap taken 08/26/96. Reflectorized sign added for I-20 and Business Spur I-20 on I-95 south near the Sumter Street overpass. It was replaced during 2004 widening. Photo taken by Chris Curley (03/24/00). Button copy guide signs for the cloverleaf interchange with Interstate 20 were replaced by 2000. Vidcap taken 08/26/96. Retroreflective signs carbon copied the button copy predecessors for Exits 160B/A. Expansion of I-95 to six lanes in 2004 replaced these overheads again. Photo taken 08/05/00. Original button copy signage at Exit 160B on Interstate 95 south. Note that the Exit 160A panel erroneously displayed a tricolor Interstate 20 shield in place of Business Spur I-20. Vidcap taken 08/26/96. Replacement signs added by winter 2000 corrected the erroneous tricolor shield for I-20 east. However these signs would be changed again when I-95 was expanded to six lanes. Vidcap taken 02/11/01. Two miles south of the eastern terminus of Interstate 20 at Middle Swamp. Business Spur I-20 is shown to the left because it is represents Exit 160A, the first of two off-ramps ahead. Photo taken 05/30/07. One mile south of Interstate 20/Business Spur I-20 on I-95 north near the Oakdale community. Photo taken 05/30/07. Interstate 95 north meets Exit 160A for Business Spur I-20 eastbound. The interchange for I-20 and I-95 is a cloverleaf with the exception of the eastbound Interstate 20 to northbound Interstate 95 ramp. Photo taken 05/30/07. Interstate 95 north reaches Exit 160B for Interstate 20. Other major east-west Interstates to conclude at I-95 include Interstate 4, Interstate 10 and Interstate 80. Photo taken 05/30/07. The first westbound reassurance shield for Interstate 20 appears as the freeway passes through a forested stretch north of parallel Jeffries Creek. Photo taken by Chris Patriarca (06/13/03). Interstate 20 angles southwest along Ninemile Draw through a series of hills to end at a trumpet style interchange in two miles. Photo taken 06/14/08. All traffic along IH 20 west defaults onto IH 10 west as traffic merges from Fort Stockton and points east from the left. Photo taken by Robert Lee (06/03/06). The zero milepost for IH 20 stands at the merge with IH 10 westbound. Exit 186 departs ahead as a U-turn ramp for return access to IH 10 east back to Fort Stockton, Ozona and Sonora. Photo taken by Robert Lee (06/03/06). A frontage road appears along the north side of IH 10 and IH 20 by milepost zero. The junction between the two freeways was historically the west end of U.S. 290. Photo taken by Robert Lee (06/03/06). Ten miles east of Kent, Interstate 10 passes between a set of parking areas on the 1.75 mile approach to Interstate 20. Photo taken by Chris Elbert (03/31/07). The roadways of Interstate 10 separate through a valley east of Spring Hills as Interstate 10 prepares to split with Interstate 20 at the Reeves County line. Although there is no exit number for IH 20, the ramp correlates with milepost 187 of IH 10. Photo taken by Chris Elbert (03/31/07). The remote split of Interstate 20 east from Interstate 10 eastbound. This point marks the departure of traffic for northern Texas destinations such as Midland and Odessa, Abilene, Dallas and Fort Worth, while Interstate 10 takes the southerly route through Fort Stockton en route to San Antonio. Photo taken by Chris Elbert (03/31/07). This older sign leaves room for the U.S. 80 shield that used to accompany Interstate 20 east to Dallas. Since U.S. 80 was decommissioned through this area in 1991, the new Clearview signs (which were added in 2006 once area construction was complete) were redesigned to omit this space. Photo taken by Steve Hanudel (01/11/05). With the exception of the space once reserved for a U.S. 80 shield, this set of signs for the IH 10 and IH 20 eastbound split was carbon copied to use Clearview font in 2006. Photo taken by Jeff Royston (12/30/00). Replaced guide signs for the left-hand ramp of IH 20 east from IH 10 east. The numbers: 383 miles to San Antonio, 428 miles to Fort Worth, and 460 miles to Dallas. The first town of any consequence along Interstate 20 is Toyah at Exit 22. Photo taken by Jeff Royston (12/30/00). Westbound Interstate 10 reaches Exit 187 for Interstate 20 east to Pecos. The two main lanes continue west into Jeff Davis County and 44 miles to Van Horn. Photo taken by Chris Elbert (03/31/07). A U-turn ramp (Exit 186) allows traffic from the ending IH 20 westbound lanes to access IH 10 east back toward Fort Stockton. The right two lanes continue west toward Sierra Blanca and El Paso on IH 10. Photo taken by Robert Lee (06/03/06). Interstate 10 proceeds north to meet Interstate 20 a short distance beyond the diamond interchange with Giffin Road. Forthcoming Exit 187 serves motorists bound for IH 20 northeast toward Pecos, Monahans and Odessa-Midland. Photo taken by Steve Hanudel (01/11/05). Replaced guide signs at the IH 10 westbound off-ramp for IH 20 east. New signs assigned the ramp as Exit 187. Photo taken by Steve Hanudel (01/11/05). The first reassurance shield on eastbound Interstate 20, posted just beyond the split with Interstate 10 through Ninemile Draw. IH 20 travels northeast toward Toyah and Pecos mostly over the former alignment of U.S. 80. Photo taken by Chris Elbert (03/31/07). 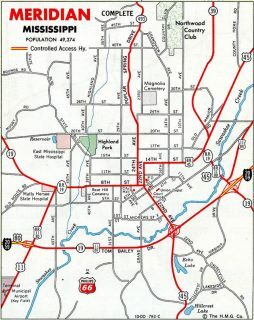 Metro Area Projects – Rankin County. http://www.mdot.state.ms.us/news/projects/stack.htm Mississippi DOT. “From Anywhere to Everywhere: The Development of the Interstate Highway System in Texas.” http://tti.tamu.edu/interstate_anniversary/white_paper/ Texas Transportation Institute, page 17. “From Anywhere to Everywhere: The Development of the Interstate Highway System in Texas.” http://tti.tamu.edu/interstate_anniversary/white_paper/ Texas Transportation Institute, page 29. Interstate Highway 59, Adam Froehlig. “Happy Birthday to the open road.” Gwinnett Daily Post (Lawrenceville, GA), June 25, 2006. “Completion near for interstate road systems,” Rome News-Tribune, November 14, 1977. “ALDOT director: Plan for I-20/59 bridges is best for Birmingham,” The Birmingham News, January 24, 2016. “ALDOT: Phase One of I-20/59 construction to begin in coming weeks,” WBRC (Birmingham, AL), July 29, 2015. Page updated January 9, 2017.